Apple is specifically seeking to drop the cost of a panel from $110 to $100, DigiTimes sources claimed on Tuesday. The people also suggested that the company could buy up to 100 million panels in 2018, with 25 million going into the iPhone X and the remainder being used for models due in the fall. About 50 million panels are said to have been bought in 2017. The exact cost of the OLED panel used in the iPhone X has been a matter of debate, since neither Apple nor Samsung have shared the information. At one point it was estimated to be as much as $120 to $130, but some people have proposed $71 or even as little as $65.50. Regardless, OLED is significantly more expensive than LCD, and Apple regularly tries to press suppliers for cheaper parts to keep profits up and shelf prices down. Apple is expected to ship three new iPhones this fall: 5.8- and 6.5-inch OLED models, and a cheaper 6.1-inch LCD alternative. 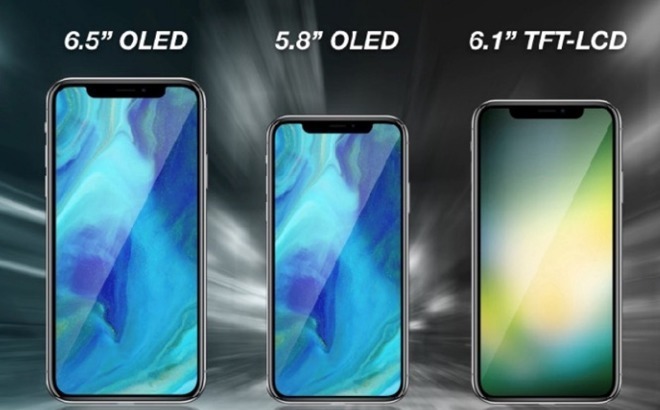 To make OLED the de facto option for shoppers, the company will likely have to sell the 5.8-inch model for less than the iPhone X's $999 —but Samsung is expected to remain Apple's exclusive OLED supplier for the near future, limiting how hard Apple can push. RBC Capital Markets analyst Amit Daryanani recently proposed that the new 5.8-inch iPhone could start at $899, shifting the $999 pricetag to the 6.5-inch model. The LCD phone has been pegged anywhere between $550 and $799.